Preppy Pink Crocodile: It's Back...FREE Subscription to Martha Stewart Living And Everyday Food! 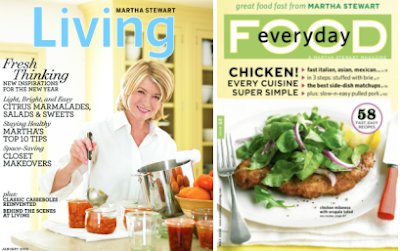 It's Back...FREE Subscription to Martha Stewart Living And Everyday Food! Click for FREE year-long subscription to both Martha Stewart Living and Everyday Food! If I've said it once, I've said it 1000 times...this is how I get almost all of my magazine subscriptions. No credit card is required. Just fill out a silly survey that takes less than three minutes and check your mailbox in a few weeks. Woot woot! Tip: You could always order this as a holiday gift, too! I didn't. I ordered it for myself. Merry Christmas to me. But I mean, you might be nicer and less greedy than me and order it as a gift. Just did it again - thank you! Thanks, I just signed up! Happy Thanksgiving!